The CardioArm snakelike surgical robot is a robot with a very small diameter that can be used by surgeons performing heart operations. CardioArm was developed at Carnegie Mellon University. Using just a single incision, the CardioArm robot can be pushed into the body. The robot consists of many small, jointed segments just 12 millimeters in diameter (see picture above); each joint follows the head through exactly the same points in space. The CardioArm snakelike robot is operated with a computer and a joystick. The smallest version of the robot is just 12 millimeters in diameter and 300 millimeters in length. Compare the CardioArm with the snake-arm robot from OCRobotics, a robot used for manufacturing. 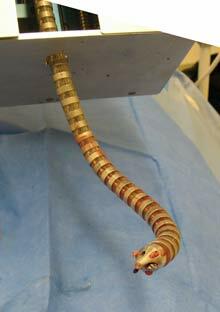 The CardioArm is also much thinner than the snake-like robots developed for surgery at Johns Hopkins University; see Snake-like Robots For Throat Surgery Doc Ock-Style. Researchers hope to miniaturize the CardioArm robot until it is small enough to enter the bloodstream through a blood vessel. "We are working to just have a single port in the body and from that point being able to reach any location," says Marco Zenati, professor of surgery and one of the principle researchers on the CardioArm project. "There is no technology that allows one to do that. The only one is the CardioArm." The earliest reference to a snakelike robot that I know about is the mining worm from Love Among The Robots, an intriguing 1946 story by Emmet McDowell. This robot moves through the body of the Earth. "He's taken the mining worm apart - that's what. I knew that he would! ...The worm was strewn all over the floor!" Via Snakelike Robots for Heart Surgery.